In today’s era of busy life flowers are the best gift to bring smile on someone’s face. So, if you are thinking of expressing your love to your girlfriend with flowers& cake then place your order today with gift Jaipur. 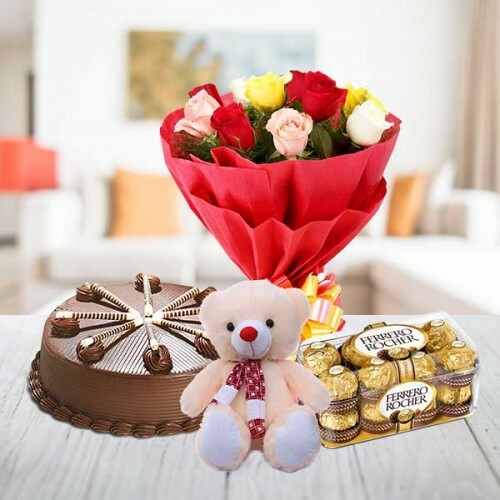 Our this the most unique hamper you can gift to your loved ones as it encloses roses, cake, teddy bear & chocolate that can bring smile on everyone’s face. •	Content: 20 Mixed flowers, 16 pieces of Ferrero Rocher’s, Chocolates half Kg cake& a teddy bear. •	Teddy bear: Size of teddy bear may vary as per your requirements (1feet – 5feet). •	It’s a perfect gift for your younger ones as it has so many chocolate and acute teddy bear. •	You can gift this chocolate hamper to you girlfriend on her Birthday or valentine’s day. •	Send this hamper as a token of your love to your loving sister. •	Keep Out of grasp of children less than 2. •	Diabetic should take distinct care while consuming these chocolates and cake. •	Delivery assurances may not apply Festive season.